The TOS Action group was formed in September 2008 by a group of individuals who share a desire to get actively involved in service work. Meetings are held the fourth Monday of each month to discuss ideas; plan how we can increase and participate in service opportunities and take the necessary action to complete the project. All meetings and activities are open to TS/TOS members, nonmembers, families with young adults, and retirees who just want to help. Participants are encouraged to get involved at their own pace in whichever project appeals to them most. Since September 2008, these meetings have been attended regularly by six-eight enthusiastic, energetic and willing volunteers who now form the core TOS action group. Service projects are usually identified by someone in the group based on interest, cost, time and number of volunteers needed to complete the project. Everyone who attends has an opportunity to talk about and/or suggest an activity of their own choice. Here is a list of some of the projects that we have done. Teamed up with LifeSource in October 2008 to host a blood drive on the Theosophical Society campus. December 2008, we identified 5 needy families in the Wheaton, IL area to receive a holiday gift basket from the TOS consisting of a combination of books/toys for the children and a gift card for food/clothing for the parents. 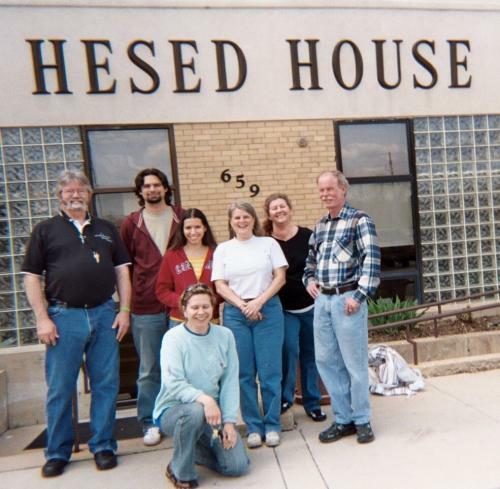 In May 2009, The TOS action group successfully raised enough money from donations to purchase food needed to prepare a vegetarian lunch for 100 individuals at Hesed house, an overnight emergency shelter which provides beds and food for up to 180 homeless men, women and children. Lunch was completely prepared and served by the TOS volunteers. We served chili, corn bread, salad, lemonade and chocolate cake. In September 2009, we sponsored a Silent Auction to raise money for our service activities. The auction was held at the Theosophical Society headquarters during their annual theosofest. Vendors were asked to donate anything of their choice. Most offered merchandise from their booths such as paintings done in acrylic, watercolors, or oil; T-shirts, a honey basket, meditation pillows and gift certificates for services like a Tarot reading, Raindrop therapy, or a massage. The $856 we raised from this auction will aid in serving the homeless community and others who have met with hard times. We also made a financial gift to a local Animal Shelter. In addition, we will purchase food and gift baskets for needy families at the holidays, including homeless veterans at the Midwest Shelter for Homeless Veterans, here in Wheaton. Finally, we are planning to post updates each month on service activities our group has been involved in.